Amanda of clothesknit is such a sweetie! After reading my recent post about loving fruitcake, she sent me a fantastic two-pound European Dark Fruitcake from Baum’s in Baton Rouge, Louisiana. It is to die for, I tell you! Thank you, Amanda! The aroma was so sweet and heavenly, I wanted to taste it right after the UPS man delivered it. Unfortunately I had just gotten done stuffing my face with chocolate Christmas bells, so it had to wait for later. I received two other wonderful packages this weekend, but each deserves its own post, so I will talk about one tomorrow and one the next day. 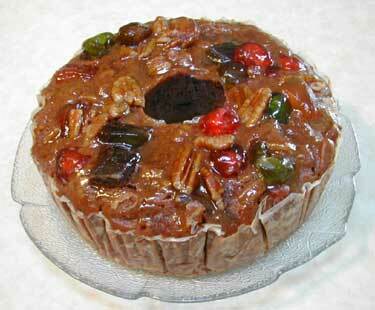 When I come home, I’ll be sure to bring you some homemade fruitcake, assuming my parents haven’t already eaten it all.